Another book review of Chesapeake Views – Catching the Light. Thank you to Dara McBride, Feature Editor at The Cecil Whig, for the current article. This is the third consecutive book review and interview by an editor recently, all unsolicited. As a photographer and writer, I’m delighted. In fairness, I must give most of the credit to the beauty of the Chesapeake Bay region. My contribution is a click of the shutter, a blink of the eye. ST. MICHAELS — At just the right moment, with just the right light, photographer Wilson Wyatt can get the shot no one else can. 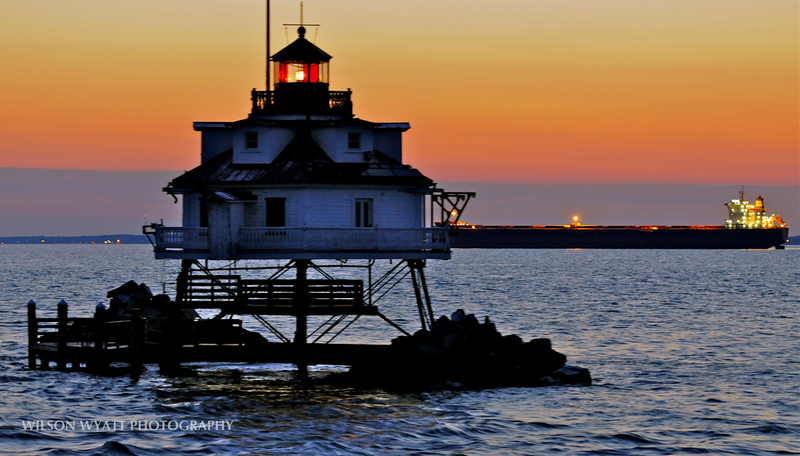 Out of 27 photographers taking photos of the Thomas Point Shoal Light, the historical Chesapeake Bay lighthouse, at dawn one morning, Wyatt walked away with the award-winning shot. After waiting for the sun to hit the roofline of the lighthouse, Wyatt captured the meeting of a cruise ship and tanker as they sky turned tangerine. The Chesapeake region has its own unique beauty, one that Wyatt has tried to capture as a photographer in his latest book, “Chesapeake Views — Catching the Light.” The scene of the Thomas Point Shoal Light, which won the Nikon Mentor Series “Best of Maryland” photo, is the cover of the book. For area residents, the book is filled with familiar sights of the Eastern Shore, of lighthouses, sailboats and sunsets over water. The tabletop book includes 82 color images taken of the Chesapeake and Eastern Shore region. Also included in the book is information on where and how many of the images were taken. Enchanted by the bay area, Wyatt and his wife decided to move to the Chesapeake region about 15 years ago. Although now a skilled photographer, Wyatt started on the other side of communications: writing. He started his career as a reporter and feature writer at The Courier-Journal in Kentucky and, intrigued by the skill of the newspaper’s photographers, took up photography as a hobby. He said he learned photography by studying the works of others and critique from mentors. Over the years he has balanced both photography and writing. Right now, he is executive editor of literary journal The Delmarva Review and is active on the board of The Writer’s Center, in the Washington, D.C. area. Today, he’s the one teaching the photography skills. As president of the Academy for Lifelong Learning at the Chesapeake Bay Maritime Museum, he leads spring classes in beginner and intermediate digital photography. He reminds himself and students that photography can be a demanding art. 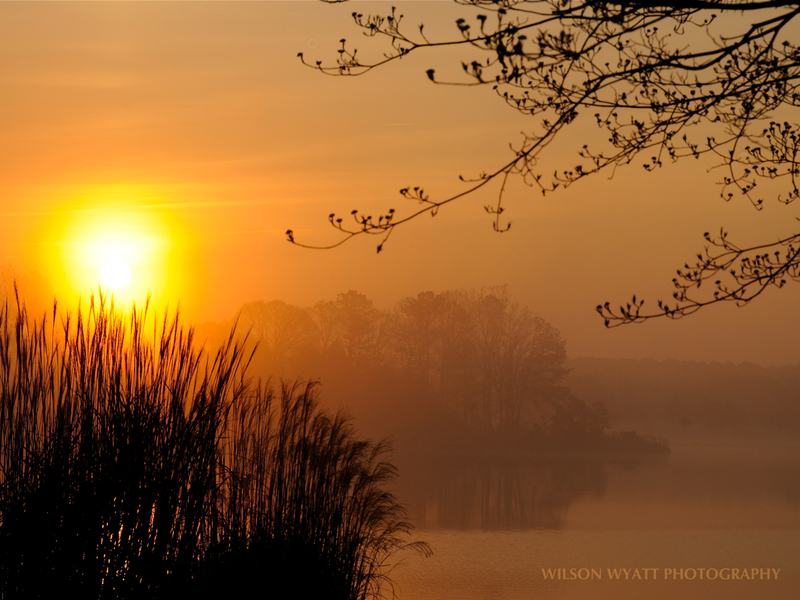 Wyatt focuses on light in his series of Chesapeake photos. Photography is more than pointing a camera and pushing a button, he said. Photography is about catching light, the colors that make up a scene, how light bounces off clouds and waiting for the moment for it all to come together. 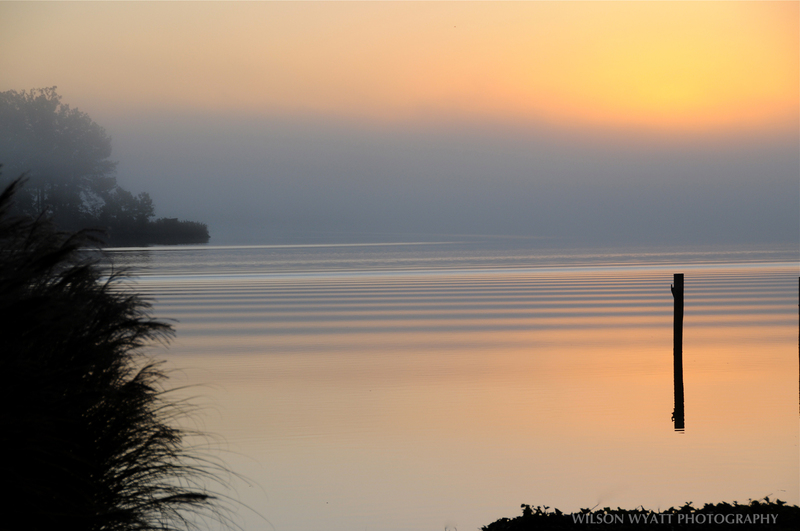 “I am definitely a morning person,” Wyatt said, commenting on his favorite time of the day to shoot. There are three stages of light to shoot in the morning, he explained: predawn light, the reflection on clouds before sunrise and the sunrise itself. Photography is “a constant discovery,” Wyatt said. “It’s always a challenge, and I wish I could go back and take many of the photos I took years ago again because I’ve gotten better,” said Wyatt. In addition to “Chesapeake Views,” Wyatt has published another hardback book of his color photography in 2011, “Yosemite – Catching the Light.” He also publishes a blog on his experiences, Writing & Photography – the Art of Words and Images, at www.wilsonwyattjr.com. ‘Chesapeake Views—Catching the Light,’ is available at Talbot County Public Libraries, the News Center, in Easton, MD and Mystery Loves Company, in Oxford, MD. For more information about signed copies of the book, contact the author directly by email at: wwwyatt2@gmail.com. The Eastern Shore Garden Club will be welcoming Wilson Wyatt, Jr., photographer, author and teacher to its second Environmental Lecture with a slide talk on “Nature and Landscape Photography,” Wednesday, February 12, 2014 at 11:30 AM at the Talbot County Free Public Library, in Easton, Maryland. It is free and open to the public. While shooting his Nikon Mentor Series “Best of Maryland” award-winning photo: “Sunrise at Thomas Point Lighthouse” Wilson waited as two vessels passed each other behind the lighthouse while the sun rose. The shot captured this changing scene taken from his boat that was also moving. Wilson says, “There is pleasure in craftsmanship but when artistry happens, we know something special has occurred. The creation is exhilarating.” When you see his photographs called “December Reflection” or “The First Sunrise of Spring” (above), the quality of light is absolutely particular to the season. He says that photography is about working with light, a mere blink of light in a moment of time with your camera being a kind of clock. Carl Sandberg put it poetically in an inscription to Edward Steichen, “camera engraver of glints and moments.” Wilson Wyatt’s first book of photographs, also on light “Yosemite–Catching the Light” grew out of a camera trek with his son, also a photographer. We were first told about Wilson Wyatt by a garden club member, who took his photography course and learned so much she recommended him for this talk. He will be giving workshops again this spring at the Chesapeake Bay Maritime Museum’s Academy of Lifelong Learning. Last year it filled quickly with 30 applicants and more on the waiting list.